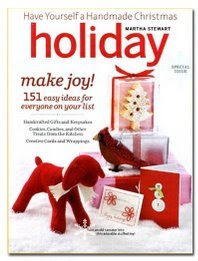 Just picked up the new Martha Stewart Holiday issue and I can't wait to start planning all my holiday decorations and crafts for this year!! I know its still super early but I like to get all my ideas in order and also make sure everything I order online comes in time. I can't wait to go home, curl up on the couch in my PJ's and start my idea list!! I got THIS COUPON in an e-mail for $2 off and wanted to share- enjoy!